Don’t be a Fail Friday statistic – wire your brain to resist that scrumptious-looking cake. So, this morning you hit the snooze button on your alarm clock several times and turned over and went back to sleep – this after you had promised yourself just two weeks back that you would hit the jogging track at 6am. Finally stumbling out of bed at 8am, you also ignored your healthy fruit salad breakfast and feasted on two chocolate cupcakes instead – which you had planned never to have again – then turned on your phone to continue that Candy Crush game you had vowed to stop playing. All the resolutions you had made at the beginning of the year have flown out the window. But then you cannot be blamed. After all, this is Fail Friday – the day you’re most likely to ditch all your New Year resolutions. Even worse, it goes on for the next week! According to a survey* conducted in the UK, the average length of time a person can expect to keep to their promise is around three weeks. By the end of the third week of January most of us will have slipped back into our old habits. Beginning today, we’re more likely to have that cigarette because we’re nervous about a meeting at work, tuck into a cupcake with our morning latte because we feel we deserve it, or stay up late on Facebook, even though we’ve vowed this will be the year we go to bed at a reasonable time. After carrying out research in 2007, British psychologist Richard Wiseman found 88 per cent of all resolutions end in failure, and Dubai executive coach Rawan Albina (www.rawanalbina.com) believes this is mostly down to us not having a clear action plan. So what can we do to ensure our resolutions are in the successful 12 per cent and we navigate Fail Friday’s stormy waters with ease? Life coach and well-being expert Sloan Sheridan-Williams (www.sloansw.com) says success with our New Year resolutions is all down to understanding our brains, which need to be in tip-top condition and limbered up ready for new behaviour. Sloan, who is based in central London in the UK, explains: “You wouldn’t climb Mount Everest in high heels and you wouldn’t run a marathon without training beforehand, yet every year people ask their brains to perform the mental equivalent, without understanding what’s going on. The area we must focus on in particular is the prefrontal cortex, the part of the brain that’s largely responsible for willpower. According to Dr Yaseen Aslam, a consultant psychiatrist at The Lighthouse Arabia in Dubai (www.lighthousearabia.com/psychiatry), this part is located at the very front of the brain and is used for abstract thinking, regulating behaviour, making decisions and suppressing urges. “The prefrontal cortex strongly influences key aspects of our personality, and it needs a balanced diet with vitamins, minerals, good nutrition and exercise,” says Dr Aslam. “Omega 3 fatty acids and antioxidants are also important. One of the key steps in caring for the prefrontal cortex is making sure it has enough glucose, but this isn’t an excuse to reach for the biscuit tin! Researchers at Florida State University in the US carried out an experiment that revealed willpower requires energy, and glucose levels dropped in people who had to use their willpower. Sloan explains: “They found that by presenting subjects with a regular intake of sugar during tasks, their discipline was greater than the control group who had no sugar. Knowing that discipline and energy levels are directly related, we can use that to our advantage. The prefrontal cortex also works best in a stress-free environment. “When the brain is preoccupied with fight or flight responses from triggers such as crowded places or stressful situations, it struggles to find energy for willpower,” says Sloan. “It’s as if it decides that determination is the least important function to power up. This leaves us at risk of making silly decisions. 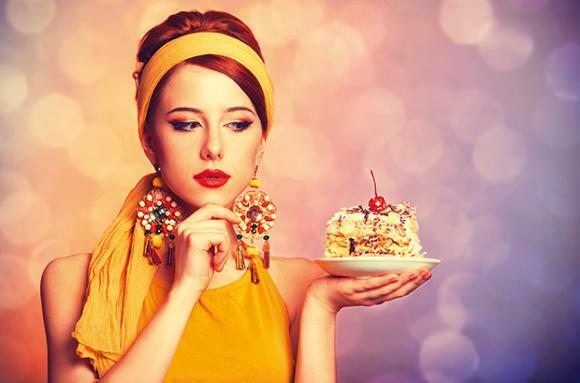 Cognitive overload is also a threat to our willpower, and research carried out by Baba Shiv at Stanford University, in the US, found that people with a lot on their minds were more tempted by sweet, sugary snacks. In an experiment, one group was given a two-digit number to remember, while the second group was given a seven-digit number. Then they were told to walk down the hall, where they were presented with two different snack options – a slice of chocolate cake or a bowl of fruit salad. The students with seven digits to remember were nearly twice as likely to choose the cake as students given two digits. The reason, according to Professor Shiv, is that those extra numbers took up valuable space in the brain, making it that much harder to resist the chocolate cake. Sloan suggests we create some stress-free slots in our lives, such as regular massages, yoga classes or calming baths. She recommends shopping at supermarkets at quieter times of the day, or doing our shopping online. With our prefrontal cortex in great shape, we’re ready to work on our resolutions. “When you have something that’s enticing, it pulls you forward. It’s much easier to be pulled forward by something exciting, than to push against something,” explains Sloan. “Whatever you anchor to the resolution will pull you forward. It may be that your mum died of lung cancer so you want to give up smoking. Your pull will be living a long and healthy life. If you want more energy, your pull might be to get down and play with your children. “Once you know what you want to achieve, develop some little rituals or habits to help you get there. These can be baby steps, like not eating carbohydrates after 5pm, weighing yourself once a week, doing a juice fast, walking up the stairs at work or getting up half an hour earlier to go for a run. “If you want to advance at work, develop some habits that will raise your standard. You could resolve to get to work 15 minutes earlier than your colleagues every day or you might decide to be impeccable with punctuality and deadlines. “Remind yourself of these new rituals all the time. Stick a photo of you looking slim on your fridge door, or put a note on your bathroom mirror reminding you of your new habit.